The latest Throne Speech had some very interesting ideas that will be coming up in the next legislative session. One of these is the introduction of absentee voting. This is an idea that is long-needed, and is a step closer for Bermuda to becoming an even more modern society. It is an idea that should be praised. However, it does not go far enough. From the Throne Speech, we find out that it will only be granted to students enrolled in accredited colleges and universities. There should be limits on absentee voting, there is no doubt about that. But this initial limit should highlight some concerns. One of the arguments that I have seen is that these students should be allowed to vote because they still hold residence in Bermuda, while temporarily living abroad to complete their studies. Well what about young professionals that are also living abroad on temporary work visas, and have no citizen status in the country where they temporarily live? One may argue that we do not know if they will ever return so they should not have the right to absentee voting. But this argument falls apart when you really apply some critical thought. First, there is no guarantee that the students will ever return to Bermuda. Life happens, people marry citizens in the countries where they are living. People decide to pursue careers in other countries, instead of returning to the island. Who is to say that these students will return, especially those holding dual citizenship. I was once told, you can never prove intent. So you cannot say that the intent of every student is to return to Bermuda. Also, if a student is living abroad they are not a resident of Bermuda. They would have been granted temporary resident status in whatever country they are in. Just like a young professional on a work visa abroad has been granted temporary resident status. If you are going to still consider a student a continued resident of Bermuda because of their temporary status abroad, than young professionals, living abroad temporarily, should be afforded the same. Then there are the Bermudians that have relocated abroad temporarily for technical or other short-term training. They are living abroad temporarily to better their lives and learn new skills or advance their careers. Why should they not have the right to vote in the country of their birth, thus ensuring that they direct the fate on some level, for a country that they may return to one day. Why are they not allowed to participate in a country where they may still have family, children and loved ones? For example, the government not too long ago sent people to learn butchering. If these persons were sent abroad by the government and an election was called, that same government would then tell them they do not have the right to absentee voting, and they would have to disrupt their studies and purchase their own airfare to return home to vote. Why is this group of students, ones that are trying their best to improve their lives, and may come back to Bermuda to make contributions to our society, also being disenfranchised? Then there is another, more social-economic concern. Higher education costs money. Money that some do not have. If a Bermudian family is living abroad temporarily, but do not have the funds to send their child or children to college or they can only afford a short-term or technical training program that is not accredited, why are they being denied the right to vote on an absentee basis, but others with the financial means can? This starts to suspiciously look like classism. Is this the type of society that we are striving to have; one where money equates to privilege? I mean to be flatly honest, it already works that way, but are we to blatantly tell people, if you cannot afford college or university, you cannot vote. In the past, if you could not afford [or you were not allowed to own] land, you could not vote. Is this where we want to return, to that blatantly discriminatory era? Of course opening the vote up for absentees needs controls. What about persons that have never lived in Bermuda, born to Bermudian parents, have dual citizenship, and are students. Are they allowed to vote on an absentee basis once they come of age to attend some affluent college? Is it right that this faceless person, who has never set foot on the island, and may never set foot on the island outside of vacation at their holiday home that is still in Bermuda, be allowed to vote? Should there be a time limit on how long someone can be abroad and still vote? Say up to five years or one voting term, since a person has left the island, before they need to reestablish physical residence in Bermuda, for a set period of time. Even the UK has a 15 year time limit. What should ours be? 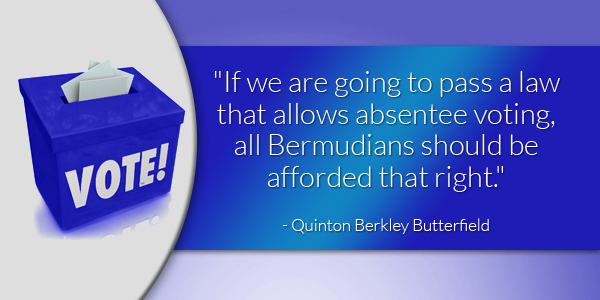 If we are going to pass a law that allows absentee voting, all Bermudians should be afforded that right. The students at university, should have the right to vote. The people that are just overseas doing training as opposed to being at an accredited, higher education institution should have the right to vote. Young professionals, with or without dual citizenship, but are only living abroad temporarily should have the right to vote. And certainly those who can not afford college or university, but have opted for technical training or other short-term training should have the right to vote. Everyone should be given the right to absentee voting if they are temporarily abroad, within certain limits, but more than has been put forth in the Throne Speech. If the government is for all Bermudians, they need to be for all Bermudians. This article is total PLP biased nonsense. A country of laws. Law should protect us all. If laws should protect us all, perhaps all residents of Bermuda should be able to vote. That would be real democracy. Given the above it would seem that “ordinarily resident” is the main restraint for providing this absentee proviso. Students are generally still under their parents stewardship and insurance already allows for this until you are 26. I could easily be argued that once someone is working abroad they are no longer dependants of their parents household and therefore have no residency claim in Bermuda. As to the author’s point about people that have never lived here, I agree as does the Constitution. If they are dependants of parent that are not resident’s there is no basis under the Constitution to give them absentee voting. I think this is a good article an a very good comment. Regarding the problem the Minister spoke of about where they would vote, this could be easily managed by having absentees declare their constituency when they register for the absentee vote. Alternatively for those not in school we could simply use their last official residence. Well spoken, Mr. Butterfield. It will be most interesting this government’s response, if at all, to Mr. Butterfield’s information. It is thought-provoking and necessary. Let’s hope that this government does allow TALK to happen on this very serious issue. I think all Bermudians, wherever they are, should be encouraged to vote. We want them to return home with new ideas and skills and perspectives and new business opportunities to keep our economy dynamic. 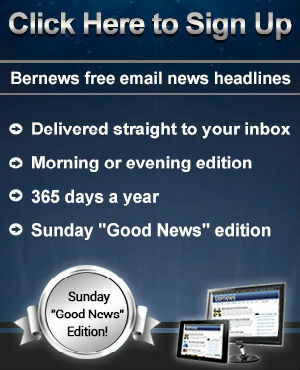 What better way to keep Bermudians abroad plugged-in than to encourage them to vote? Perhaps they’ll be more likely to stay in touch, follow the local news and retain their personal and professional connections to the island. This would be good for all of us. I welcome the move to allow Bermudian students abroad the ability to vote and understand the need for certain requirements to be met in order to be able to vote. Accredited means that it is a recognised learning institution and the vast majority of students from Bermuda that study abroad attend accredited learning institutions. I agree that all Bermudians overseas should be able to vote not just the ones who are students at accredited schools. However with this brings up issues if this were to be allowed. Bermuda would have to come up with a way to prove that these people are who they say they are and meet the requirements to vote (18+ Bermudian or resident since 1976 (I think that’s the date). They would also have to make sure that they haven’t voted already on the election. So only after those issues are solved, only then should Bermuda allow it. It really can’t be open ended. As examples, my father left here when he retired over 25 years ago, as a Bermudian, should he be allowed to vote in Bermuda? I don’t think so. My brother, a Bermudian, is also living abroad, after studying overseas and has not lived here for over 10 years. Should he be allowed to vote here? I don’t think so and they wouldn’t expect to be able to vote here either. If you are living overseas, apart from for educational purposes, it is hard to imagine why anyone else should be allowed to vote here. Going 1 step further I think that PRC’s and Spouses of Bermudians should also be allowed to vote. They obviously have a stake in the islands future. Not sure about spouses and well most PRC’s will be able to soon anyway. The idea is as you have stated for students abroad to vote. What this opinion piece and comments are discussing is the idea that it should be open to others too, which certainly debatable. But Lois I know many spouses of Bermudians who have lived here for years but still continue to vote in their own birth countries as they are allowed. Let’s face it nobody wants to be totally disenfranchised. I agree that all Bermudians abroad, who can prove proof of Bermudian zcitienship when they apply for an absentee ballot should be allowed to vote. Good for you Mr Butterfield. If it is going to be just students at first then I can understand why some veracity in the form of checking the educational institution is necessary or any Bermudian abroad could sign up for a simpl college course just to get the absentee vote. To v\avoid any thought of discrimination the obvious answer is to let all Bermudians outside the country APPLY for an absentee ballot. It might be a case of be careful what you ask for. I wonder what the political breakdown would be of all Bermudians living abroad? I agree with you Lois. I think the geniuses at Alaska Hall didn’t think this through when they started questioning the rules for Students. Why is this being made so complex? It should be a simple matter that if you are a registered voter you should be able to vote if you happen to be off the Island. If you are a student, where you are studying has no relevance. If home is Bermuda & you are registered, you can vote. Same with an adult. It really does not matter where you are in the world. If you happen to be away from Bermuda, where you are registered to vote, you should be able to do it online. Who knows when an election is going to be called? They only need to give 3 weeks notice. People traveling cannot be expected to plan their travels around a possible election. We can all do our banking & feel secure anywhere in the world. The simple matter of voting should not be difficult to set up. Seniors here on the Island should be able to vote online. For some of them getting out to do anything is a very big effort with risks to them. Bermuda is just so far behind times. This is the best response to this situation. I believe that ALL BERMUDIANS no matter where they are living should be allowed to vote, and have access to absentee voting. No matter if we are college students, on work visas [like me], or living abroad permanently, Bermuda is our documented home and we may choose to return back, so we should have some say. Plus many of us have assets, businesses, family, and other interests in Bermuda so we should always have a say to our land. No. If you’re living overseas you pay no taxes here, and you are not affected day to day by the consequences of voting one way or another. Students are ordinarily resident here. What I am hearing is that Bermudians living away shouldn’t vote because e are not affected by hat we vote on. lies. How am I a registered Bermudian, temporarily living in USA on VISA , which means I am due to return HOME not affected eventually? Elections are for how many years? Even if I am not moving back in 4 years, some laws made governments have a lasting impression for years after that will affect me. I am not affected b/c i dont live in Bermuda now??!! lies. My entire bloodline is living in Bermuda. When they are affected, so am I.
I believe if I am Bermudian [documented] then I have the right to vote and right to absentee ballot. For those that disagree, I respect your opinion, i just can not agree to let you take away my right b/c of my living situation that is based on laws and the environment in Bermuda in the first place. If you want a voting system based on your ownership of property in Bermuda, then I invite you to Bermuda in the 1950′s, which we have gladly moved away from. Paying Taxes does NOT equal Land owner!!! I never said I want voting right based on land ownership. My reason for bringing up land, assets, businesses is to prove to people that just b/c i dont live in Bermuda, doesn’t mean i am not affected by laws there, b/c of these assets it surely affects me. Great! These comments are awesome! Glad I could get the discussion going.